Present state: The station was demolished to make way for an extension to the Kingfisher Leisure Centre. 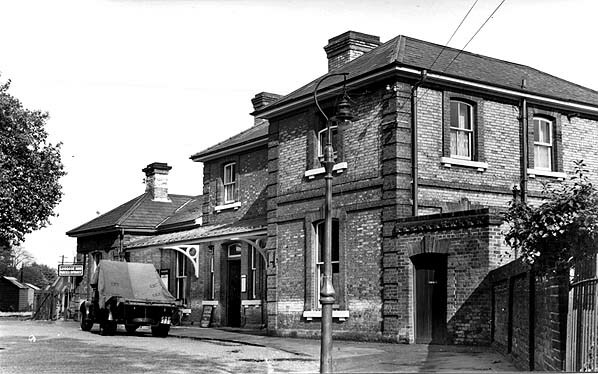 Notes: The original Sudbury Station was opened on 2 July 1849 as the terminus of the branch from Marks Tey. 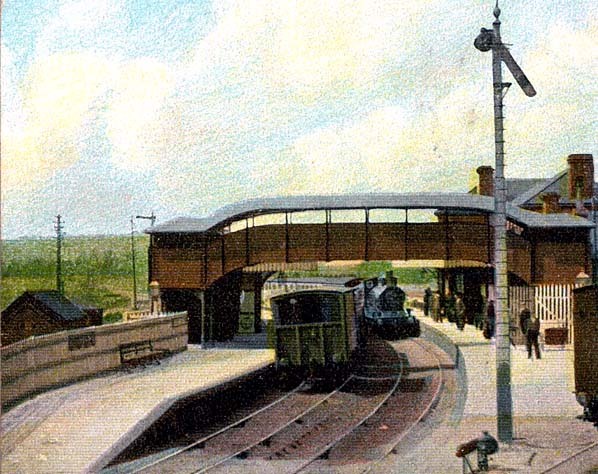 When the line was extended to Cambridge, a new through station was opened on a new alignment to the south and the original single platform terminus became part of the goods yard. The new line skirted the south side of the town which overlooked the River Stour flood plain. Due to its siting on the edge of the flood plain, there was never any substantial development to the south of the station. The new station was built on a curve with two facing platforms with a slight stagger. The main station building possessed a modest dignity and was a larger version of those found at some intermediate stations on the line beyond to Bury St Edmunds and Cambridge, and on the Braintree – Bishops Stortford line. Located on the up side it comprised a two-storey L-shaped stationmaster's house with a hipped slate roof; this included the booking office and stationmaster's office on the ground floor. The east end of the building was single storey and also 'L' shaped and included waiting rooms and toilets. Both sections of the building were in cream-coloured brick with red brick used for the quoins and the door and window surrounds. 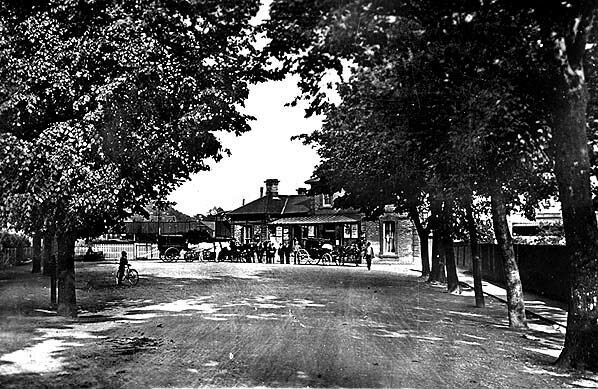 The station was sited at the end of a tree lined approach road known as Station Avenue. 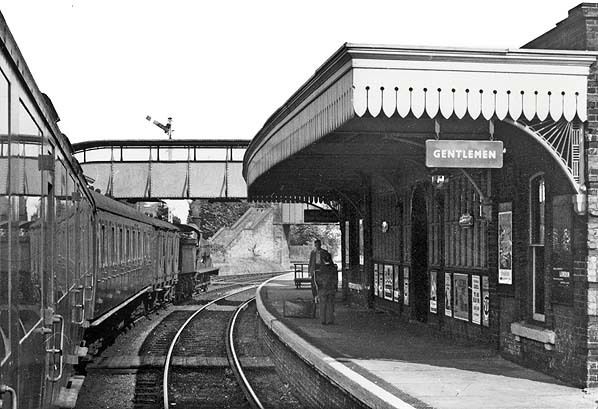 There was a short canopy above the entrance for the benefit of arriving passengers with a substantial flat timber canopy with a fretted valance stretching the length of the building on the platform side. There was also a W H Smiths bookstall. There was a smaller brick building opposite on the down platform comprising waiting rooms and toilets with a similar timber canopy stretching the width of the platform in front of the building. There was a covered iron footbridge of a notably austere design at the east end of the building. This was probably a later addition as it does not appear on early maps, and its somewhat crude appearance contrasted with the handsome design of the main building. A loop line ran behind the down platform. Although the bulk of the goods yard was to the north-west with an entrance in Great Western Road. There was a dock running immediately behind the station building. This was certainly used for horses and may also have been used for livestock although the pens were opposite the first station platform, some distance away. Sudbury had two signal boxes. Sudbury Goods was on the down side, 400 yards to the east of the station. This controlled access to the goods yard. The station box was on the up side a short distance to the west of the up platform. With the closure of the Cambridge line on 6 March 1967, Sudbury once again became a terminus, and a buffer was placed across the track near the west end of the up platform which was now the only platform in use. Although the bulk of the line between Sudbury and Shelford was lifted in 1970 the track between Sudbury station and the Gasworks Cut (short arm of the River Stour Navigation) remained in place until c1974. When this track was eventually lifted most of it went to the Colne Valley Railway for use at their station. 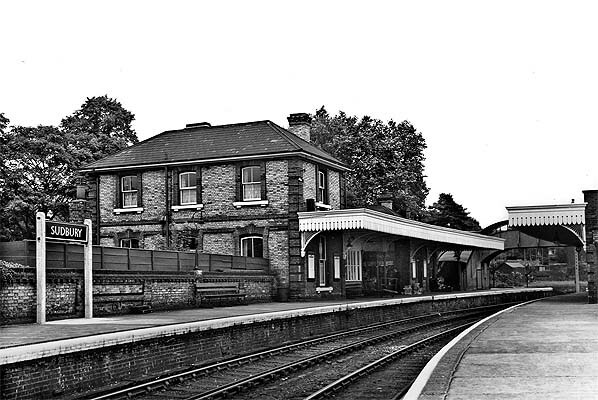 The station was unstaffed from 15 August 1966, and the station building was boarded up and unused until 1974 when it found a new lease of life as the Sudbury Museum. The museum remained open until a break-in and fire in 1985 forced the museum to vacate the building. Sudbury goods yard closed on 31 October 1966 but Sudbury Goods signal box remained open until January 1981; it was demolished two months later. By 1982 the down platform buildings had been demolished and the station footbridge carefully dismantled and rebuilt at the East Anglian Railway Museum at Chappel station. By 1986 the track had been cut back and the west end of the platforms removed during the construction of the Kingfisher Leisure Centre. By 1989 the track had been further cut back requiring a short timber extension to the east end of the platform to allow trains to continue using the station. The section of platform under the canopy was fenced off and a bus shelter was provided for protection from the weather. Sudbury station closed on 28 October 1991 and the station was once again resited to the old dock a short distance to the east to allow redevelopment of the 2nd station site. The station building was quickly demolished and the Kingfisher Leisure Centre was extended onto its site. The third station is still open as the terminus of the branch from Marks Tey. It is now the northern terminus of the Gainsborough Line, which is managed by Greater Anglia, who provide all train services. The unstaffed station is looked after voluntarily by 'Sudbury in Bloom' and is annually entered into the 'Anglia in Bloom' station competition, where it has won the Silver Gilt award in 2006, 2007 and 2008. The station also won the 'Best Station Garden' award at the 2008 ACoRP Community Rail Awards. A self-service ticket machine has been provided adjacent to the platform entrance. There is one train an hour operated by class 153 and 155s. The class 153 Super Sprinter is a single car diesel multiple unit converted from British Rail class 155s. The Act renewed the authorisation for the proposed ECR lines to proceed with the addition of a connecting line at Haverhill between the Stour Valley and Colne Valley railways. The first section between Shelford and Haverhill opened on 1 June 1865. The remaining lines from Haverhill to Sudbury followed on 9 August 1865.
current Sudbury station. The end of a horse box can just be made out. 1904 1:2,500 OS map shows the layout of the station. The original terminus is at the top of the map; this became the town's goods station when the line was extended to Cambridge in 1865. The cattle dock and pens are seen opposite the old terminus building. 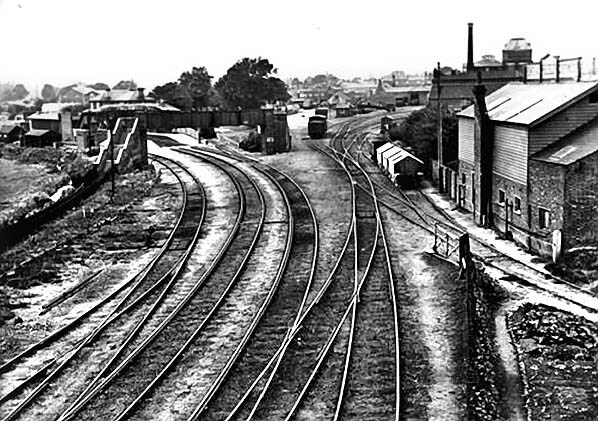 Numerous sidings serve the malthouses on the west side of Great Eastern Road. Each has a small wagon turntable for moving wagons between sidings. A reversal from the line into the goods yard gives access to a short siding serving a railway-owned chalk pit seen top right. An additional goods dock is seen running behind the up platform. Two signal boxes are shown, one at either end of the station. The station box is on the up side to the south-west of the station and the Sudbury Goods box is on the down side to the east of the station. Click here for a larger version of this map. 1963 1:2,500 OS map shows little change, either to the station or goods yard. All the sidings serving the malthouses are still in use but the chalk pit and its siding have gone and the pit is occupied by an engineering works. The original station platform is identified on the north side of the yard but the cattle pens opposite appear to have gone. The 5-ton capacity yard crane is identified just south of the main goods shed with the coal yard along the southern boundary of the goods yard. An early 20th century view of the southern approach to Sudbury station seen from the signal post opposite Sudbury Goods signal box. The original terminus was straight ahead; this was closed in 1865 when the line was extended to Cambridge and a station was opened on the new alignment to the left. At this time the old station was incorporated into the goods yard. The line branching off on the right , which required a reversal from the goods yard , served a railway-owned chalk pit. A number of carriages are parked on the station forecourt awaiting the arrival of the next train c1910. The boy with the bicycle under the trees on the left side of Station Avenue was H. Ray Hills who became Mayor of Sudbury in 1955. Sudbury station forecourt in July 1953. The stationmaster's house is seen on the right. Following closure of the booking office the building was used as the town's museum from 1974 until it was damaged following a break-in and fire in 1985. 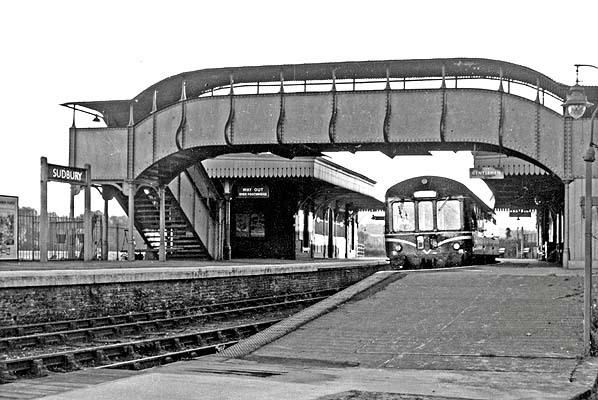 A railbus is seen in the up platform of Sudbury station, probably in the late 1950s. British Railways produced a variety of railbuses as a means both of building new rolling stock cheaply, and providing services economically on lightly-used lines. 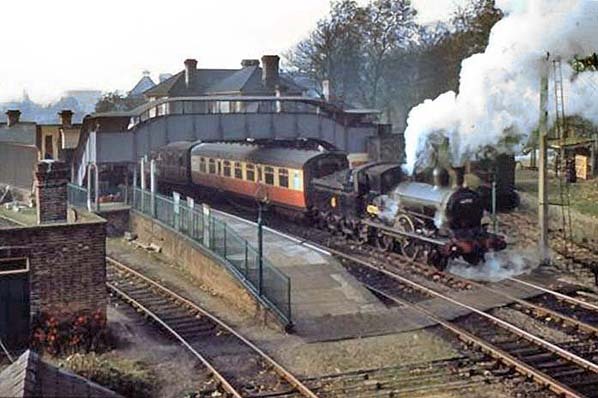 A Marks Tey train waits in the up platform at Sudbury station in September 1958. The less substantial down platform building housing waiting rooms and toilets is seen on the right. Note the BR Eastern Region totem signs fixed to the building; being of half-flange design they will have been installed by 1957. Although these signs survived well into the 1960s they had been removed long before corporate identity signage was installed, and not a single Sudbury totem has ever been offered for sale. An eastbound passenger service hauled by 62785 prepares to leave Sudbury station in October 1958. With just 12 months’ service left this Holden-designed E4 was built for the GER at Stratford works in 1895. The 2-4-0 entered GER service as No. 490 in the January and passed into LNER service at the Grouping where it was renumbered 7490. Renumbered to 7802 in November 1942, it was again renumbered by the LNER in 1946 to 2785 and received the 6 prefix at Nationalisation. Withdrawn from 31A, Cambridge shed, during December 1959, this loco has happily been preserved as part of the national collection and is restored to GER livery. It is the only surviving example of this class. 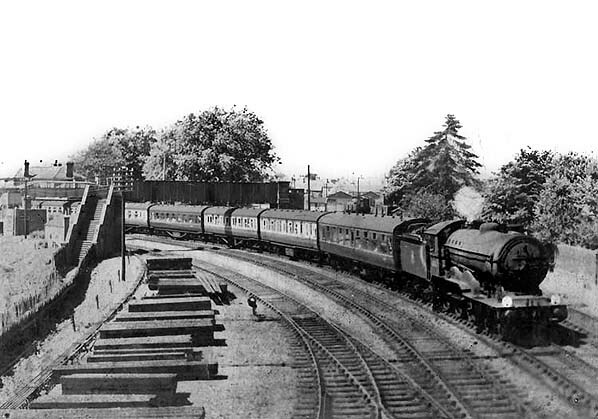 An excursion train is seen leaving Sudbury station probably bound for Clacton. The photograph was taken from up in the Sudbury Goods signal box c late1950s.